Ghana’s world title chasing Patrick Allotey (38-3, 30 KOs) tilted the scales at 152 lbs and the Ugandan challenger in their WBO Africa junior middleweight championship tonight, Badru Lusambya (26-3-2, 24 KOs) came in a pound heavier at 153 lbs at the weighs in Accra on Friday morning. It’s a first defence of the title Allotey won after thoroughly beating compatriot, Frank Dodzi in 6 dominant rounds at the same Bukom Boxing Arena venue for tonight’s clash back in April, on the back of which the 27 year old Ghanaian hitman rose into the WBO junior middleweight world ratings at number 15. Now he aims to silence Lusambya, the former African Boxing Union (ABU) super welterweight champion who has been talking loudly since arriving in Accra on Thursday, claiming among them that he will defeat Allotey and take away both the title and the Ghanaian boxer’s wife. “I’m very focused on going all the way to win the world title, so nobody can intimidate me. He can say whatever he likes but the ring will decide whether he has the fitness to take my punches,” Allotey told Lusambya right in the face after a few skirmishes between the two just after both made the required weight. Not to be cowed into submission however is the brash Lusambya, the 35 year old whose last defeat came in a bid for the vacant WBF super welterweight title to Azerbaijani, Fariz Mammadov in February 2016, and has racked up two straight knockout wins in his native Uganda since. “I am here to win and take this title home and as I told you already I will also take his wife away with me to Uganda,” Lusambya told the crowd at the exquisite Sandbox Beach Club inside Labadi, also in the Ghanaian capital. Backing Allotey to reign supreme and march on in pursuit of world glory is Ivan Bruce-Cudjoe, manager of Allotey and CEO of Cabic Promotions and Management who are staging a total of ten fights laced with musical performances by top Ghanaian hiplife artiste, Tictac and rising Papa Row among others in what is their second event since they started work in February this year. “I know Patrick my boy and what he can do, I have no doubt he will put a good show and win this fight convincingly. I always say come and see everything for yourself, don’t wait to be told. We assure fight fans of excitement, fun and top competitive action in the ring too,” Mr. Bruce-Cudjoe said. 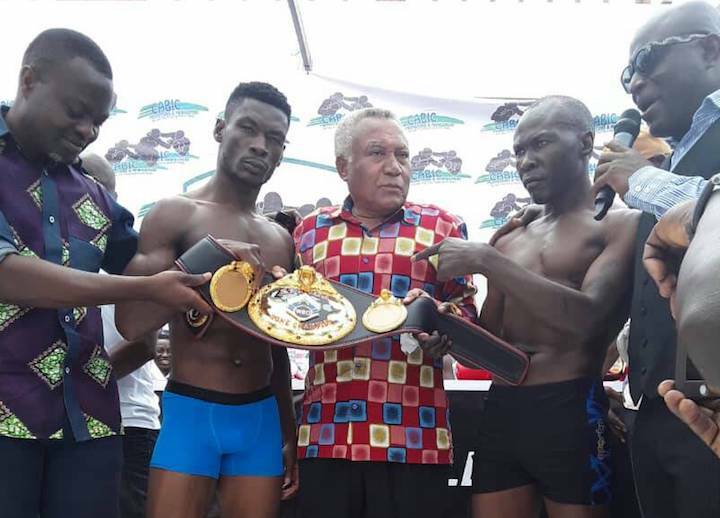 In the event, two other WBO Africa titles are also at stake on the night featuring two Ghanaians against boxers from neighbouring countries and all also made the required weights to set up the WBO Africa super middleweight championship between Emmanuel ‘Mayweather’ Martey, the Ghana super middleweight champion and Sunday Ajuwa of Nigeria (13-3, 10 KOs) as well as Richard Harrison Lartey against Boniface Kabore of Burkina Faso for the WBO Africa heavyweight belt. The undefeated Martey (12-0, 9 KOs) weighed 168 lbs, the exact same limit Ajuwa had to basically strip naked to reduce the two pounds over he first recorded on the scales. Lartey (12-1, 9 KOs) tilted the scales at a whooping 245 lbs to the massive disadvantage of Kabore (20-5, 12 KOs), a former WBA Pan-Africa light heavyweight champion who weighed a paltry 192 lbs. On the other undercards, Emmanuel Quaye, also a boxer in the Cabic Promotions stable, weighed 158 lbs to the 163 of opponent for their middleweight contest over ten rounds, Illiasu Sulley who came in overweight. Michael Tagoe and Thompson Arab Moi both made 124 lbs for their super bantamweight 8-rounder whilst Justice Addy (152) and Daniel Adoku (157) made it for their 10-round middleweight contest, as well Solomon Martey (126) and Joshua Barnor (127) also set up their featherweight 8-round contents perfectly. 3 concluding fight fixtures on the night saw Charles Amarteifio (137) and Amos Denji (134) make it for their super featherweight contest, Samuel Akulugu of Ghana weighed 137 for an international super featherweight contest against Alexis Kabore of Burkina Faso (27-3, 7 KOs), who previously won all of the WBA Pan-Africa, Africa Boxing Union and WBC international titles as Emmanuel ‘Akufo Addo’ Quartey also weighed 130 lbs and his opponent, 129 ahead of their featherweight contest. Next boxing news: How Great Was Riddick Bowe?